We are buckling down for a messy, icy storm. I left the office early, a thing almost unheard of, slogging from the train through a few inches of slush and ice. I wanted to get home before things fell below freezing, and even so the trip had its moments. Now we are home, hunkered down, cooking a vast pot of chili and compulsively reading articles about disaster readiness and the blizzard pointing straight at New England. So I feel like it’s the right time to show this photo, which I took on a summer night last June in downtown Detroit. All of downtown was just lit up. Some private event at the ballpark kept unpredictably firing off lots of great big fireworks. The streets were thronged – people going to restaurants and clubs, people out for a walk. The People Mover was rushing carloads of people around; people were staring covetously in the windows of glittering shops that had not existed six months before; couples were walking hand in hand; and as we got out of the car we saw that the Opera House had something going on outside, something big and blingy, this: the runway show Walk, highlighting Detroit’s diverse fashion community. We hung on the fence for a while to watch the whole spectacle – beautiful people of many shapes, sizes and ages, showing interesting clothes before an appreciative, sophisticated audience. The night air was warm and soft. I never thought I would say these words about my home town, but all of downtown just seemed glamorous and forward. 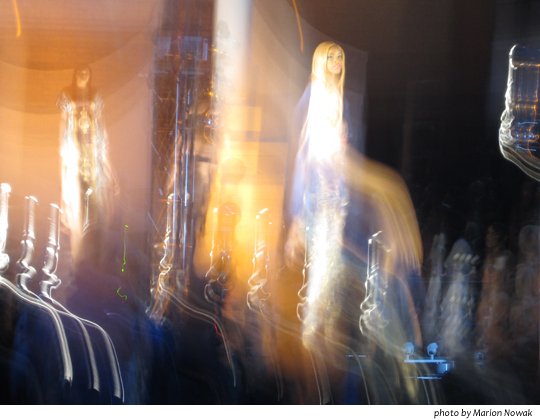 This entry was posted in Uncategorized and tagged Detroit Opera House, Detroit's Walk fashion show, Downtown Detroit. Bookmark the permalink.